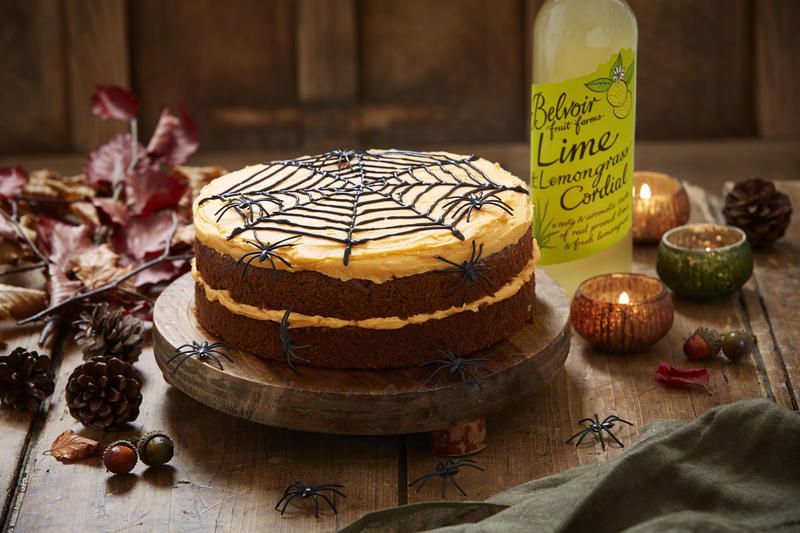 This Halloween-take on my lime and lemongrass carrot cake recipe is a spookily sweet, seasonal treat. Preheat the oven to 180oC/Gas 4/Fan 165oC. Lightly oil a 20cm deep cake tin and line the base with baking parchment. Coarsely grate the carrots. In a stand mixer or with an electric hand whisk, beat together the oil, sugar and eggs until they are light and fluffy. They need to be thick enough to leave a trail when the whisk heads are lifted. Add the carrots and remaining ingredients and mix well. Pour mixture into the cake tin and bake for 45-50 minutes. Leave to cool in the tin for 10 minutes before transferring to wire rack. While cake is cooling beat together all your ingredients for the frosting. Add enough food colouring to make it a bright orange. Once the cake is cool, cut in half horizontally. Spread half the icing in the middle of the cake and sandwich together. Spread the remainder over the top and smooth with a palette knife. Pipe the black icing over the cake to look like a spider’s web, then finish with plastic spiders.